HIMSS has announced their second annual National Health IT Week Blog Carnival which will run from September 16-20. I am honored to be asked to host this year's Blog Carnival during National Health IT Week on behalf of HIMSS. I expect there are going to be some great posts, as we have a passionate community who will be able to promote the value of health IT in helping to achieve the triple aim: Improving the patient experience of care; Improving the health of populations; and reducing the cost of healthcare. Members of the health IT community are invited to write some new and original posts that answer the question: "What’s the value of health IT?" Bloggers should post between Monday, September 16 and Thursday, September 19. HIMSS and I will review each submission and publish round up posts on ahier.net. We're not looking for sales pitches so try to keep them non-promotional and focus on the health IT trends of the year. After you have published the post during National Health IT Week then send the link to HIMSS@shiftcomm.com for review and addition to the carnival. The Office of the National Coordinator for Health IT (ONC) will hold the 3rd Annual Consumer Health IT Summit to learn about public and private sector led advancements to equip and empower patients to better manage their health in a digital era. The 12th Annual HIMSS Policy Summit will explore how we can better engage patients through meaningful use and the road to safety regulations. I plan on attending this event. The Childhood Cancer Caucus will highlight federal efforts to combat childhood cancer, as part of National Childhood Cancer month. An interactive policy forum sponsored by the Bipartisan Policy Center will look at key technologies and trends that are ushering in the era of personalized medicine. 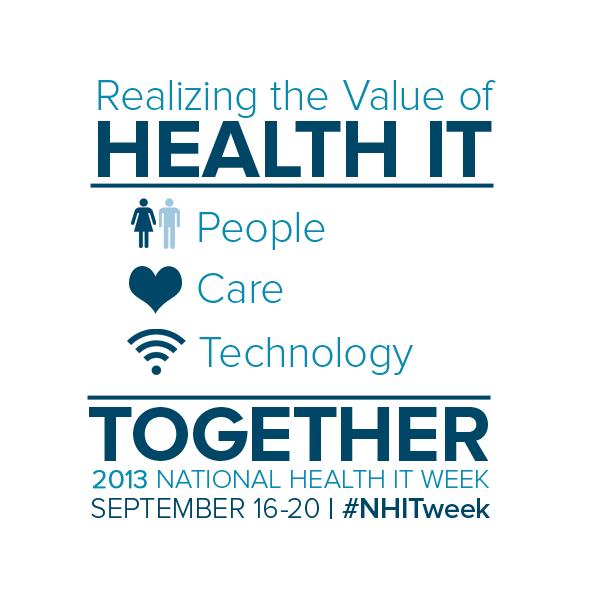 Keep and eye on the National Health IT Week website to stay aware of all the events. 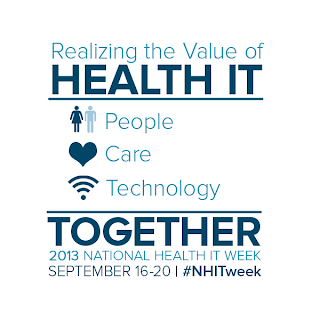 HIMSS is also providing a social media strategy toolkit for use during National Health IT Week, including some very cool images you can download HERE to post on your blog or use to change your profile image. They also provide some great advice on how to leverage social media for National Health IT Week. We'll be using the hashtag #NHITWeek so even if you don't write a blog you can help get the word out and join in the tweeting. Also, Jennifer Dennard (@SmyrnaGirl) will be hosting a #HITchicks tweetchat on September 19th during National Health IT Week, and stay tuned because there will be a number of opportunities to participate in Tweetchats, Google Plus Hangouts, LinkedIn discussions, and other social media platforms during the week. For more information on the Blog Carnival, please contact: himss@shiftcomm.com. The ONC hosted a Direct Boot Camp 2.0 on August 13-14, 2013 which built on ONC’s 2012 Direct Scalable Trust Forum with a clear focus on helping Direct implementers and supporters accelerate the scalability and interoperability of their implementations to support meaningful use stage 2. Participation was from a wide range of organizations implementing or working to enable the Direct Project specifications including State HIE grantees, Beacon communities, EHR vendors, HIE/HISP vendors, Certificate Authorities, Registration Authorities, Federal Agencies, and any participants in the broader Direct Project community. One of the panel discussions was titled "Federal Agency Requirements for Exchange via Direct." The moderator was Eric Larson, Program Manager of the Federal Health Architecture and and included Debbie Bucci, ONC, Bob Dieterle, CMS, Glenn Janzen, IHS, Mike Mathews, DoD, and Melissa Sands, VA. They sought to explain the policy requirements for provider to provider exchange between federal agencies and non‐federal HISPs. They gave a nice overview of their risk analysis process and the Federal guidelines and requirements. they also discussed some of the Federal use cases for Direct. The big news here is that DoD, VA, IHS, and SSA will be using Direct secure messaging and are seeking private sector partners. David C. Kibbe, MD MBA President and CEO, DirectTrust and Lee Barrett, Executive Director, EHNAC gave an overview of the DirectTrust accreditation landscape, and discussed in detail what is required for different types of accreditation, as well as the specific process steps and timelines. Day 1 ended with an awesome demonstration of the Direct Project Reference Implementation by Greg Meyer, Distinguished Engineer at Cerner. The video below shows him demonstrating how to configure DNS for certificate discovery. John Hall, Coordinator, Direct Project, and Greg Meyer, Director and Distinguished Engineer, at Cerner, led a discussion of the implementation guidance for enhanced Direct message delivery notification and how it supports assurance and accounting of message deliver for critical use cases.